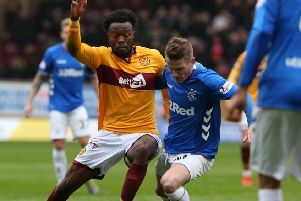 Motherwell's dreams of finishing in the Scottish Premiership's top six this season were extinguished on Wednesday night when they lost 3-1 against Aberdeen at Pittodrie, writes Craig Goldthorp. It was a night when luck deserted the visitors, with a hugely fortunate Aberdeen opening goal and the loss of inspirational Motherwell keeper Mark Gillespie to injury after 68 minutes. It was Max Lowe who scored the fluky goal to put Aberdeen ahead inside five minutes. His attempted cross sailed over visiting keeper Gillespie and into the net. Aberdeen created the bulk of the early chances with Lewis Ferguson's long range shot going just wide, the same player having a second effort saved by Gillespie and Sam Cosgrove going close to scoring with a couple of headers. But Motherwell were also playing some good stuff and a stunning 40-yard pass by Richard Tait set up Jake Hastie to net his seventh goal of the season to level after 36 minutes when he scored after taking the ball around keeper Joe Lewis. There was a nervy moment for Motherwell soon after Hastie's goal when Aberdeen skipper Graeme Shinnie sent a left foot shot just too high. Connor McLennan and Niall McGinn then had speculative efforts saved by Gillespie. There was then the severe blow for Motherwell when keeper Gillespie - outstanding all season since replacing Trevor Carson - slumped to the turf after an aerial collision with Aberdeen's Cosgrove. Gillespie was stretchered off and replaced by Rohan Ferguson. Sadly, Ferguson's first involvement in the match was to pick the ball out of his net as Aberdeen went ahead. It was McGinn who rifled the Dons 2-1 in front after 71 minutes after Stewart's initial effort had been blocked by Tom Aldred. Dominic Ball then shot over for the hosts on 83 minutes before deep into injury time Motherwell missed a great chance to equalise when Liam Grimshaw headed over from a great position. And it was game over for the Steelmen when McGinn curled a fine effort into top corner from outside box to make it 3-1 in the dying seconds. Motherwell: Gillespie (Ferguson 68), Grimshaw, Aldred, Dunne, Tait, Campbell (Cadden 76), McHugh, Turnbull, Hastie, Main, Ariyibi (Frear 76).